As a believer, at the core there really is nothing more important than God. And for you, a cross is just the reminder you need during your day to help your soul “be still.” Boojee Beads has lanyards in beautiful designs specifically for the Christian who wants to affirm their faith during their workday to themselves and with fellow Christians. Our lanyards and ID badge holders conform to professional standards and all the while make for gorgeous necklaces. We have sophisticated and subtle crosses as well as bold crosses. Get one for yourself,but don’t forget that they make great, sentimental gift ideas for your church members, friends and family. To accessorize is to show the world a little bit of your inner self. 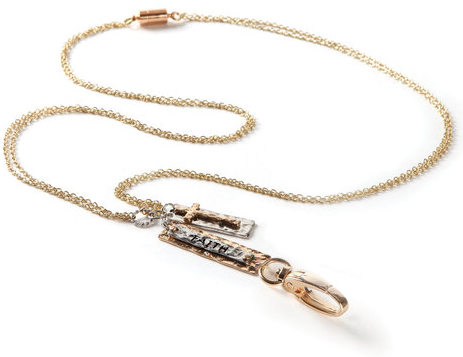 This Faith Lanyard metallic necklace has multiple hammered plate charms that are both ancient and modern at the same time. One of the plates has a rose gold cross and the other plate has the word Faith engraved in all caps. A double set of golden chains makes this lovely lanyard strong enough to withstand everyday usage without worrying it will break. A spinning lobster hook holds your ID badge without worry. At only $11 it’s a beautiful and yet meaningful accessory that you cannot lose the opportunity to have. Our 3-in-1 Fish Ribbon Lanyard is a bright and happy way to show your beliefs with the iconic fish symbol and a cross on the reel. On the polyester ribbon,you will find an ocean full of the same fish symbols. The ribbon is machine washable, so you can always refresh it when it starts looking a little smudged. For people who are very active in a work place where safety is an issue, such as hospitals, clinics or offices and manufacturing plants with machinery, the breakaway clasp can be a saver! The clasp stays closed all throughout the day, but as soon as your lanyard catches onto something, the clasp snaps open, to keep you from getting caught yourself. The ribbon hangs a full 19-inches from the back of the neck to keep your ID in plain view at all times. You can also detach the badge reel to wear alone when you do not want your ID hanging down. The reel features a sturdy clip that holds securely to a pocket or collar. The clip on the retractable badge reel hangs off of your pocket or belt. And have fun with the recoiling action! Instead of having to unclip your badge reel every time you need to swipe or show your ID to security, just pull on your ID or key card, the cord extends out to 32” and then the recoiling action of the badge reel will simply wind the cord back neatly into the reel. One pendant carries the message of love while the other one features a cutout cross, both in fashionable hammered metal.The most important commandment is …what? Love. Remind yourself and others of this message every day with our Love Lanyard. The beautiful double golden strand lanyard is as strong as you are. With a breakaway clasp and a spinning lobster claw, you can keep your ID badge handy without worrying about tangles. If lanyards are not practical in your line of work, try one of our lovely Christian badge reels. Each one has a 32-inch retractable cord for ease of scanning and spinning alligator clips to keep your ID facing straight at all times. 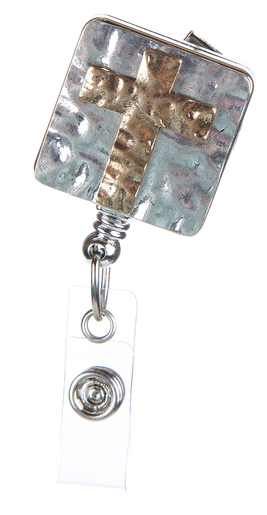 The Hammered Cross Badge Reel is made of two-toned hammered metal with a cross featured in the center. Our Purple Cross Badge Reel puts a bit of sparkle in your day. The silver background features a cross of regal purple rhinestones offset by tiny crystal stones. Let your fun and fanciful inner you shine with our whimsical Daisy Cross Badge Reel. A white cross with a single rhinestone in the center is offset by an array of colorful flowers. To protect your ID badge, add a clear bi-way pocket. With openings for horizontal or vertical badges, this is a must-have. For frequent swiping, try our different versions of the hardened plastic swiper. Our transparent swiper or our bulkier white or black gripper hold onto your ID securely on one side while the magnetic strip is left free for convenient swiping all day. To accessorize is human, to express your faith is divine, to shop Boojee Beads is fulfilling. As a company founded by working women, we are aware of the features women look for when shopping for unique lanyards and badge reels. Fashion, function, and faith all come together in our Christian based line. Contact us today to find the perfect expression of faith for you.